For Newly Arrived Migrants, Paris Offers An Upgraded Welcome : Parallels It's taken a while, but Paris finally has a safe place for migrants congregating in the city. A new facility has been opened which offers asylum seekers showers, medical care and a bed. 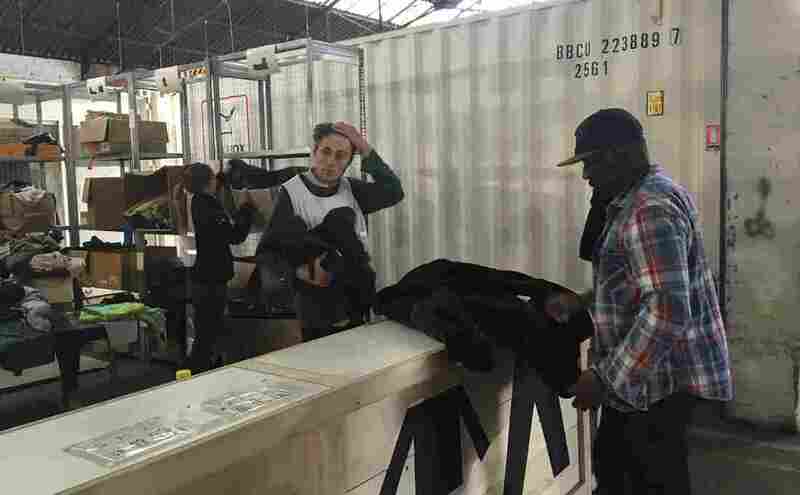 A recently arrived migrant (right) receives clothes at Paris welcome center for migrants that opened earlier this month. They can stay for up to 10 days, but are then moved to migrant centers around the country. The humming of 50 washers and dryers is the first sign that things have drastically changed for migrants in Paris. Right next to the washing facility volunteers hand out sweaters and coats to the newly arrived migrants. One volunteer worker is trying to fit Sadique Ula Malagzai with shoes. The young Afghan wears a flip-flop on one foot and a puffy, white bandage on the other. Malagzai walked to Paris from Italy. "The shoes hurt me and when I finally took them off my foot was injured," he says. Malagzai says he has gotten great medical care here. "And the people are so polite. They respect us." That is the whole point of this place, says Bruno Morel, the head of Emmaus, the humanitarian group that runs the center. Morel says this is not a refugee camp, but a welcome center, and the first step into the asylum process in France. "We wanted to have a place where people were treated with dignity," says Morel. "And we wanted to get them off the street. In the street you're struggling to survive, so you can't possibly do what you need to restart your life. And you're prey for smugglers and traffickers." The discussion about refugees in France has often focused on the squalid, makeshift migrant camp in the northern port city of Calais, on the English Channel. That's now been demolished. Paris wasn't much better. Migrants from conflict zones and dictatorships in the Middle East and Africa used to sleep in the street. Over the last year and a half, Paris police have cleared 22,000 migrants from tent cities on sidewalks and under train trellises. They were bused to migrant centers in other parts of France. Paris Mayor Anne Hidalgo wanted to change that. So the city of Paris, the French state and humanitarian groups came together to build this facility. It opened Nov. 4. It's located in an unused industrial site in the north of the city and can shelter up to 600 single men. "It's not a refugee camp," says Patrick Vieillescazes of the Paris police department, which is also involved. Rather, he describes it as the first gate in the system. Migrants who arrive in Paris — and 40 percent of migrants who come to France head for the capital — are now welcomed here, in a heated, inflatable tent where they get a cup of coffee and an interview. There is a medical unit on site, showers, TV rooms, meals, and insulated wooden cabins for four people. But Vieillescazes explains that this is only a first stop. Asylum seekers are assisted in putting together their asylum applications, but they cannot stay here more than 10 days. They have to move on to one of 250 permanent migrant centers somewhere else in France. "We explain to them that if they don't want to accept the place we propose in the French provinces, then we can't shelter them here," says Vieillescazes. "That's the rule. Otherwise the system won't work." Running this center costs about $45 per migrant, per day. There are 120 employees and 500 volunteers that keep the operation going. On this November evening, migrants — including a couple with a baby — are waiting outside the center's gates. The facility is full, so volunteer Jeremie Chouktrain is calling around to find other lodging. He says this center is great but it can't keep up with the 100 or so new arrivals in the city every day. "At least we have something trying to deal with the basics," says Chouktrain. "The people arriving and being lost — but the needs are so huge that this place is actually quite small." 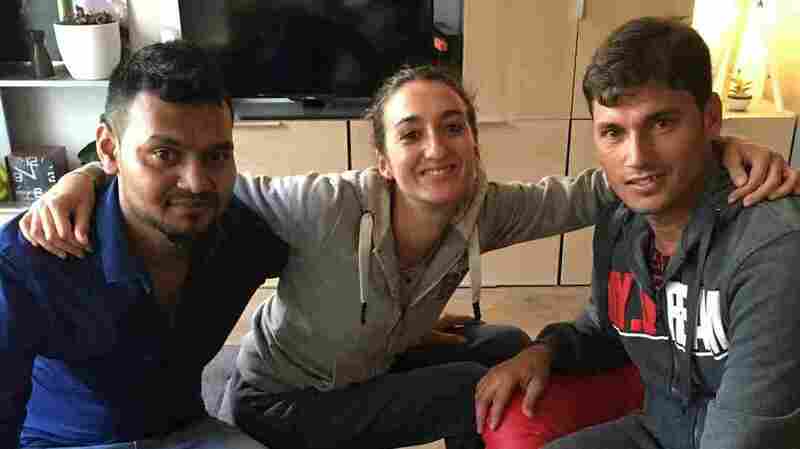 Marion Chabrel (center), 37, has taken in two migrants as roommates, Brahim (left), from Bangladesh, and Shabada (right) from Afghanistan. Beyond the camp, Parisians are pitching in in other ways. Marion Chabrel, 37, lives with her dog Benny in a cozy apartment in a working-class Paris neighborhood. Chabrel sells shoes and was on a business trip last spring when she decided to visit the squalid migrant encampment in Calais, known as "The Jungle." "I was in a great hotel room just near Calais and I watched this program on TV," she says. "And there was my dog sitting on my bed in my four-star hotel and I just thought, 'It's not possible to just stay here and do nothing.' "
So Chabrel went to the squalid camp and met Shabada, a 27-year-old Afghan man, who like many of his compatriots, uses just one name. They became friends and he's now staying in her apartment. She is also helping him with the asylum process. She says the biggest issue for her is being safe and she felt she could trust him. "And he proved me right," she said. "I went on holiday and he took care of my dog." Still, Chabrel wanted to do more, so she went on Facebook and contacted an organization called Refugee Bienvenu, or welcome, which helps place people waiting for answers to their asylum requests in individual homes. Today the group's coordinator, Victoire Bovet, came for breakfast at Chabrel's apartment. "I'm Parisian, I was born and raised in Paris and I saw my city changing," Bovet says. Her organization, which is run by students like her at the Sorbonne University, helps to match those who have applied for asylum and are just waiting for a response, with Parisians ready to put them up. On this day, Bovet introduces Chabrel to Brahim, a gay man from Bangladesh who fled persecution and fears giving his last name. The two will sign a "moral contract" before he moves in. It lays out the rules of the house and mentions any specific requirements of either party. Chabrel says she's happy her two new roommates can communicate in Hindi. And they say she has changed their lives. As the three pose for a picture with Marion in the middle. She fondly refers to Brahim and Shabada as her new roommates and bodyguards.